User: User identities, effectively this is your central identity store. Role: An object for modelling roles. Assignment: An object for modelling assignments. Assignments are effectively ways of capturing sets of entitlements across mapping. Which can then be associated with roles. In this blog we will examine the user managed object in detail, roles and assignments will be explored later in the series. Organisations, divisions, teams or other parts of a business. Anything else you can think of! Managed objects are completely configurable. Which organisations a user belongs to. The devices that a user owns. The products a user has. The teams that belong to an organisation. Details: The name and icon that represents the object in the UI. Schema: Properties, their validation rules and their relationships. Properties: Rules for special attribute behaviors e.g. passwords should be encrypted and private. Lets look at each of this in detail. Not much to say here. Just the name of your object and you can select a funky icon that will be displayed throughout the interface wherever your object is used. The properties that actually comprise your object. Lets take a look at the managed user schema. 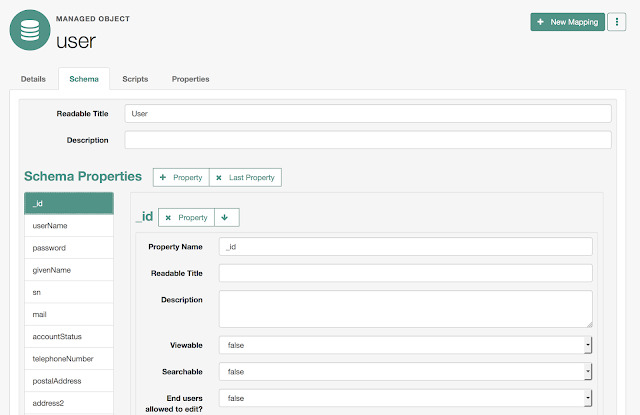 On the left, under Schema Properties you can see each property that comprises a user. There are many properties available out of the box and you can easily add or remove properties as required. Let’s look at a property in detail. Property Name: The internal name users within the OpenIDM platform to refer to the property, think of it like a variable name only used internally. Readable Title: The name that will be used to refer to the property in the user interface. Description: Simple description of the attribute that when populated is used throughout the interface as a tooltip. Viewable: Can it be seen in the UI? Searchable: Is it indexed and searchable in the UI? End users allowed to edit: Used are allowed to update the value using self service. 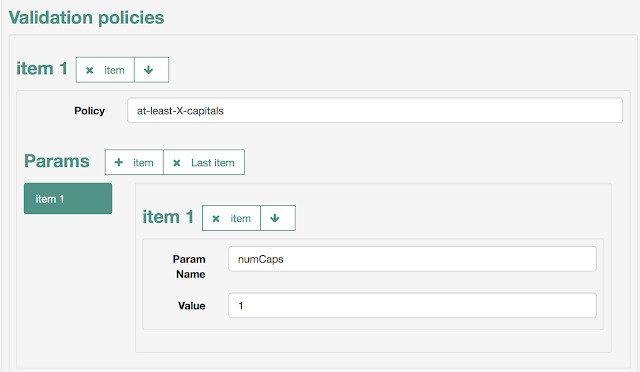 Minimum Length: Minimum length of the attribute value. Pattern: Any specific pattern to which the value of the property must adhere. e.g. date formats. Validation Policies: Rules that can be used to define attribute behavior. We will look at these in detail in a moment. Required: Must be populated with a value. Return by Default: If true, will be returned when user details are requested via the API. If false, will only be returned if specifically asked for. Type: Type of the attribute: String, Array, Boolean, Integer, Number. Object or Relationship. We will look at relationships in a moment. Validation policies are ways to validate the attribute. 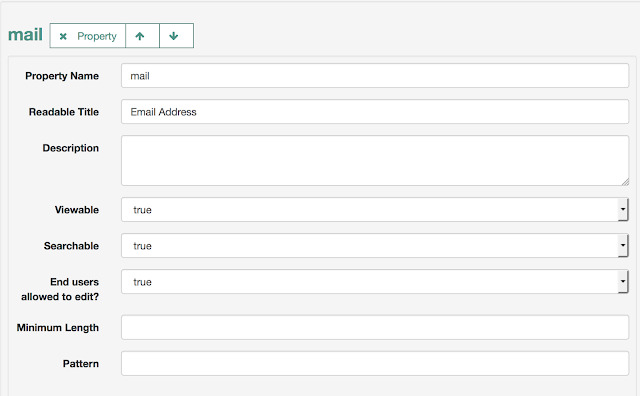 The example below checks that the mail attribute is a valid email address. This prevents the user from inputting an invalid email address during self registration or an administrator changing the email incorrectly. Relationships are incredibly powerful and really at the heart of what OpenIDM does. If you have installed OpenIDM in part 1 then I recommend you take a look at the out of the box managed objects to really understand this, however we will briefly discuss it. The out of the box managed user object defines a relationship between managers and reports. User’s have a manager. This is a Relationship. It is in fact a reverse relationship. As manager A, has reports X,Y,Z and reports X,Y,Z have the manager A.
User’s can also have reports. They may have multiple reports. Note this is an Array of Relationships: A manages X, A manages Y, A manages Z. Likewise this is a reverse relationship. Relationships let you model relationships between all sorts of types of objects, users, organisations, devices, products, anything. Objects also have events which can be used to trigger events. onCreate: The script that runs when the object is created. In this case, a script used to set the default fields for a user. onDelete: The script that runs when the object is deleted. In this case, a script is used to cleanup users after deletion. These scripts are completely configurable and new scripts can easily be added. Script – Inline Script: script defined within the UI. Script – File Path: a script stored within the OpenIDM configuration directory. This is how out of the box scripts work. If you navigate to /openidm/bin/defaults/script/ui you can examine these out of the box scripts to see what they do. Workflow – Event can be used to trigger a workflow. Scripting is a great way to do all sorts of things to help you manage objects. Properties let you define additional behaviors for attributes. Encrypted: The attribute value is encrypted. This means it can be decrypted and the value retrieved if required. Private: Restricts HTTP access to sensitive data, if this is true the attribute is not returned when using the REST API. Virtual: The attribute is calculated on the fly, usually from a script. Hashed: The attribute is hashed. Hashing is a one way function and the usual way that passwords should be stored. You hash the password when a user registers for the first time. When they log in again subsequently you hash the password that they enter against the original password hash. If they match you know the passwords are the same. Crucially, it is impossible to take a hash and extract the original password from it. You can examine the script here: /openidm/bin/defaults/script/roles/effectiveRoles.js. For the final part of this blog I want to take a look at something I think is pretty cool. The OpenIDM REST API. All managed objects ( including the ones you can create yourself ) are automatically made available using a REST API. Using the API you can Create, Return, Update and Delete objects ( CRUD ) as well as search for and query objects. We will dive into the REST API in a later series but we can do a quick demo just to get a feel for how it works. Note the long string of letters and numbers. This is the object id for our new user. Very useful Blog Wayne! Do you know if the ‘relationship’ aspect is the core differentiate between Identity Relationship Management product and the rest of ‘traditional’ IAM product? Especially, I am really keen to know if the following attributes such as users and its relationship with the organisation should go in the CRM or it is part of standard IRM data model. Wayne, i have relationship between managed/user (via privAccts attr) and managed/privAcct (via owner attr). when i go to admin screen to list managed/privAcct objects, I dont see value in Owner field column. how can I get to show the managed/user? when i set “return by default” to true, it shows [object Object], and if set “return by default” to false, the owner field has no value in the UI that lists privAcct.